Behind Jeff Sessions’s decision to abandon asylum protections for victims of domestic violence is the story of “A.B.” The Salvadoran woman, identified in court documents by her initials, endured more than a decade of physical abuse by her ex-husband, who she says also raped her and repeatedly threatened her life. In an effort to escape the abuse, she moved to a town two hours away, filed numerous restraining orders that went unenforced, and sought a divorce—none of which deterred him. He followed her and the violence escalated, according to her lawyers. In one incident, he brought along his brother, a police officer, and threatened to kill her. To protect her life, A.B. eventually made the difficult decision to leave her three children in El Salvador and claim asylum in the United States, hoping to bring them over later. Immigration advocates worry that the decision undoes decades of progress on women’s rights and human rights, and worry about what it means for the future. “Jeff Sessions has basically taken the Department of Justice’s role and taken away its traditional independence and instead usurped it to enact White House policy and his own personal racist agenda,” Camille Mackler, Director of Immigration Legal Policy at the New York Immigration Coalition, told Jezebel. What that has meant so far is that the Trump administration has been systematically dismantling the asylum system at every stage, making it harder for people to cross the border, harder to file for asylum once they’re in the country, and harder to get access to a court hearing. Now, with Monday’s announcement, Sessions is looking for ways to restrict the enforcement of very legal standards that protect refugees. Sessions can’t change the laws on asylum, but he can control how immigration judges apply those laws. 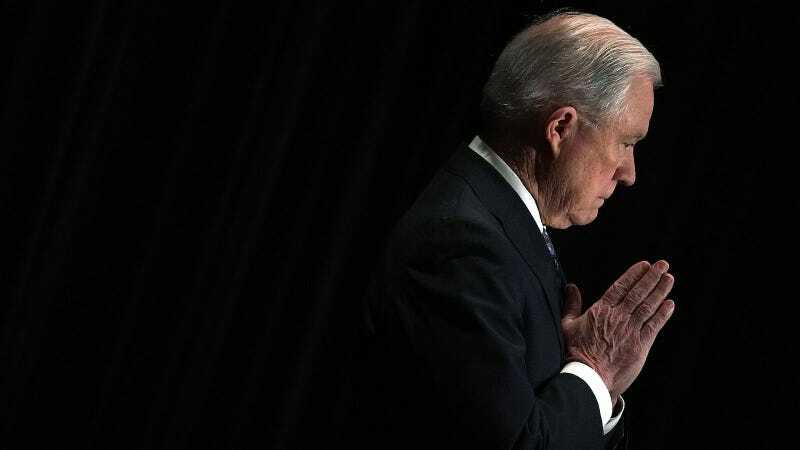 The Justice Department runs the immigration court system, which is independent of the civil and criminal justice system that imbues Sessions with hiring and firing power over lower court judges. If immigration judges don’t abide by Sessions’s directives, or adhere to his new, prohibitive quotas, they risk losing their jobs. Asylum can be granted on the basis of race, religion, nationality, membership in a particular social group, or political opinion, provided the individual can prove their government will not protect them. In 2014, the Obama administration recognized domestic violence as a basis for asylum in the United States—a landmark decision by the Immigration Board of Appeals. The case granted asylum to Guatemalan woman Aminta Cifuentes, whose abusive husband had burned her with acid and hit her so hard during pregnancy that she went into premature labor. The abuse had been so severe that the baby was born with bruises. The decision set a precedent to protect women trapped in abusive relationships as a social class seeking asylum. It was under this precedent that the board granted A.B. asylum protection, which Sessions has now revoked. Public Radio International recently reported on the uncertain fate of a Honduran woman identified as Naomi, who fled Honduras to escape a violent boyfriend who had beaten her, sexually assaulted her, and burned their four-year-old son with a pot of boiling oil. She sought asylum in the U.S., hoping to bring her son after being granted asylum. But she has waited for five years to receive an immigration hearing on her application and with Sessions’s announcement, she does not know what will happen to her, PRI reports. The government does not consistently track asylum claims made based on gender-based persecution, but immigration advocates expect this law will hurt tens of thousands of women like Naomi and A.B. The decision may pave the way for more restrictions on women refugees, too. “The disdain for women’s claims and the rejection of the social group and the underlying theories itself could have an impact on women claiming other forms of gender-based persecutions as well,” said Bookey. That litigation process could take years. In the meantime, Jeff Sessions has implemented a policy that will result in suffering, violence, and even death for women who, until Monday, could have hoped to find safe harbor in America.